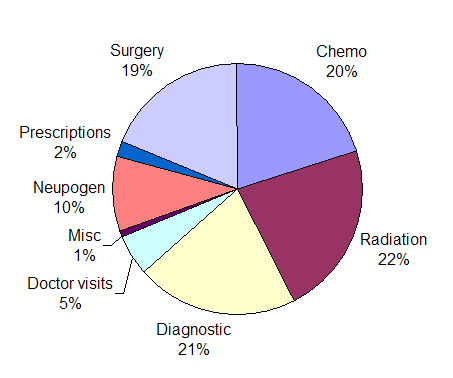 This page shows the total cost for curing my lymphoma, a breakdown of how much I paid versus insurance, and a list of guesses that people made on how much treatment would cost. The total cost to cure my lymphoma was $77,633. This figure includes what was actually paid by both me and my insurance company. To determine the actual "cost to cure" I only considered bills from the date I first went to the doctor for symptoms until the date I received my "all clear" PET scan (October 2003 through May 2004). How much did I pay out-of-pocket? People often ask me, "How much did you have to pay yourself?" The answer: About $1,500. * Not included in total since I would have had to pay this anyway for health coverage. Included for your information. I thought it would be fun to try and guess how much everything would end up costing when everything was said and done. Below, I've recorded the estimates from anybody who sent one to me. The average guess was $137,599 (off by $59,966). The lowest guess was $48,000 (off by $29,633)). The highest guess was $300,000 (off by $222,367).